This evergreen plant With the glossy gardenia-like foliage is becoming increasingly popular wherever it is offered to house plant growers. It does not require any unusual culture or care which is much in its favor. It belongs to the Acanthus family which also includes several other favorite plants, as the beloperone (shrimp plant), justicia, aphelandra and others. Its natural habitat is in the East Indies, Africa and Madagascar. The Greek name means “fringed anthers”. The height of Crossandra is about 12 inches. When it reaches desired tallness it is a good idea to pinch out the tip. Then the plant will branch nicely. It is a bushy appearing plant since the foliage is stalkless, the leaves being directly attached to the plant stem. The leaves are mostly opposite, and being shiny they always look neat. The flowers come from green bracts on four-sided spikes. A well branched plant usually has several of these spikes and each carries many wide clusters of overlapping florets that produce a truly unusual display. The slender, tubular part of each flower ends in a five-lobed, flat, clear salmon colored showy bloom. The stamens are within the slender tube and so are not visible among the florets. This secret seed producing arrangement posed a problem for me when I grew my first crossandra. How could I find the pollen within this slender tube, to help nature along? Before long I noted that nature had a way of helping herself, without my hands or the helpful insects that we depend on in the orchards and fields. Each green bract contained a large, tan colored, oblong seed. I was surprised to find such large seeds. These I dried and planted, but without germination. One day when I had several of these seeds dry and ready to store, I had what I thought was an accident. One of the precious seeds broke open and out fell four nice, flat, tan colored true seeds. The large seed was a seed-pod or capsule. 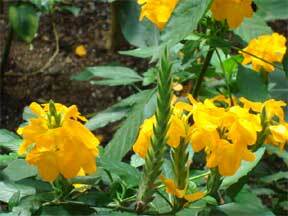 The “do it yourself” crossandra had revealed its seed producing secrets. After planting, these seeds soon germinated and a pot of sturdy seedlings were all set for a life of their own. They bloom when about nine months old, and as the plant grows, more and more flower spikes are produced. Propagation is easy with cuttings taken from partially mature stems at any season. Younger growth may also be rooted, when taken with a heel (a small portion of the more mature stem where the young growth was removed from the plant). The cuttings root well in water, moist coarse sand, or vermiculite. The usual potting soil, 1/3 each of rich loam, peat moss or leaf mold, and coarse sand is suitable, and good drainage is necessary as for all potted plants. The soil in the pot should be moist but never muddy-wet. It does bloom month after month, but when the spikes have only a few florets left, the pot should be kept rather dry until the seed pods turn tan in color and can be taken from the bracts to continue the maturing of the seed. Never permit the foliage to wilt or shrivel for lack of moisture during this semi-rest period. If seeds are not desired the spikes may be cut off after flowering. New spikes bring new florets. This plant is happy in any window where it gets good light and some sun. I do not recommend long, continuous hot sun for it. My plants have also felt at home in the south bay window where the sun reached them filtered through other taller plants. It is also being grown successfully under fluorescent lights.